Join us for Bring Your Own Mat yoga classes led by local teachers at the beautiful Fairmount Park Horticulture Center. This class is not suitable for first time yogis. 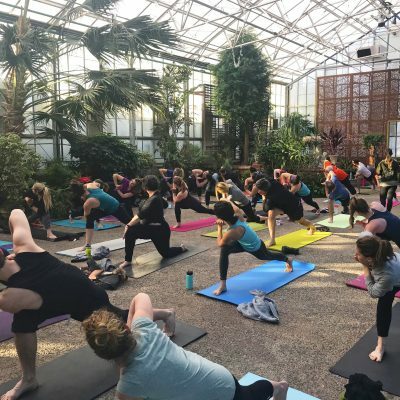 Enjoy yoga classes in a heated greenhouse surrounded by tropical plants at the Fairmount Park Horticulture Center ! All classes are from 1pm – 2:30pm. Please note these classes are not appropriate for students who are brand new to yoga. Please bring your own yoga mat and water! Please note that the floor of the Horticulture Center is similar to an outdoor surface. You may want to bring something to place under your yoga mat (both for padding and to keep your yoga mat clean) or be prepared to clean your yoga mat after the class because it will get dirty! The classes are $15 for non-members, FREE for members of the Fairmount Park Conservancy. Membership to the Fairmount Park Conservancy starts at $35 and helps support our work in Philly’s parks. At $50 and above you will receive a Park Perk Pass to use throughout the park system for exciting discounts (including the new Treetop Quest course, Shofuso, Wheel Fun Rentals, etc). To learn more about membership please click here. We encourage participants to walk, bike or take public transit to The Horticulture Center in West Fairmount Park. The Horticulture Center is a five-minute walk from the Please Touch Museum, in West Fairmount Park, Philadelphia. The Horticulture Center will be directly ahead. Parking is also available at the Horticulture Center.